CONNECT!...to either a Calendar of Events in the deaf, hard of hearing, and deaf-blind communities in your hometown and statewide or find other websites and resources that will provide you with informational resources relating to hearing loss. The TN Department of Education encourages postings of position openings in K-12 public schools. Review Job Listings - listings are only visible during their availability period, check back often. This calendar is for everyone wanting to know about events in the deaf, hard of hearing, and deaf-blind communities in Tennessee! You may browse upcoming events or submit information to have an event from your organization posted! 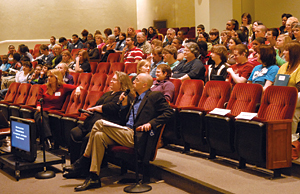 We are also making information about national conferences relating to hearing loss available! Graphic View - looks like a calendar! Search the calendar for an event by either Region and/or Type of Event. Just click on the down arrow next to one or both categories to make your selection, then click on Search. List View - shows a list of posted events by date. Add an Event - Anyone may submit information for an event to be added to the calendar! You may even attach a flyer or a logo! Find other websites that offer information about hearing loss. They are listed by categories. (Move your cursor over the Connect button and choose from the sub-menu next to Helpful Links.) Some categories are general (e.g. National organizations) while others are specific (e.g. Parent Info). If you cannot locate a resource you are looking for, first look under Miscellaneous and if you still cannot find it, then contact us to help.